BOULDER, Colorado, December 10, 2016 (ENS) – Unusually high air temperatures over the Arctic Ocean, persistent winds from the south, and a warm ocean have resulted in a record low Arctic sea ice extent for November, say scientists at the National Snow and Ice Data Center, NSIDC, at the University of Colorado, Boulder. November 2016 is the seventh month this year to have hit a record low extent in the 38-year satellite monitoring period. “It looks like a triple whammy – a warm ocean, a warm atmosphere, and a wind pattern all working against the ice in the Arctic,” said NSIDC director Mark Serreze. 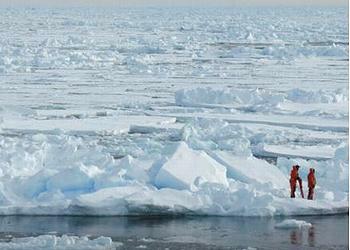 It’s not just the Arctic that is affected. In the Southern Hemisphere, Antarctic sea ice extent also hit a record low for the month, caused by moderately warm temperatures and a rapid shift in circumpolar winds. For each metric tonne of carbon dioxide (CO2) that anyone on the planet emits, three square metres of Arctic summer sea ice disappear. This is the finding of a study published in the journal “Science” this week by Julienne Stroeve from NSIDC and Dirk Notz, leader of a research group at the Max Planck Institute for Meteorology. These calculations enable us for the first time to grasp the individual contribution to global climate change. Notz and Stroeve compared corresponding model calculations with data from satellite measurements, and discovered that the climate models underestimate the loss of Arctic sea ice. The study concludes that the two degrees Celsius global warming target set in the Paris Agreement on climate will not allow Arctic summer sea ice to survive. 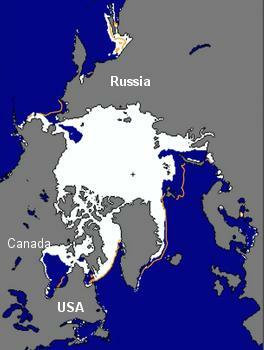 The rapid retreat of Arctic sea ice is one of the most direct indicators of the ongoing climate change. Over the past 40 years, the ice cover in summer has shrunk by more than half, with climate model simulations predicting that the remaining half might be gone by mid-century unless greenhouse gas emissions are reduced rapidly. The NSIDC analysis shows that Arctic sea ice extent averaged 9.08 million square kilometers (3.51 million square miles) for November, 1.95 million square kilometers (753,000 square miles) below the 1981 to 2010 long-term average for the month. Although the rate of Arctic ice growth was slightly faster than average, total extent decreased for a brief period in the middle of the month. The decrease in extent measured 50,000 square kilometers (19,300 square miles) and was observed mostly in the Barents Sea, an area of the Arctic Ocean north of Norway, Finland, and Eastern Russia. NSIDC scientists said the decrease in Arctic sea ice extent is almost unprecedented for November in the satellite record; a less pronounced and brief retreat of 14,000 square kilometers (5,400 square miles) happened in 2013. The November extent was 3.2 standard deviations below the long-term average, a larger departure than observed in September 2012 when the Arctic summer minimum extent hit a record low. Extending from northeast of Greenland towards Svalbard and Severnaya Zemlya, air temperatures at about 2,500 feet above sea level were up to 10 degrees Celsius (18 degrees Fahrenheit) above the 1981 to 2010 long-term average for the month. Sea surface temperatures in the Barents and Kara Seas remained unusually high, up to four degrees Celsius (seven degrees Fahrenheit) above average around Novaya Zemlya, Russia, and also around Svalbard, Norway, preventing ice formation. These high temperatures reflected a pattern of winds from the south, which helped push the ice northward and reduce the ice extent. 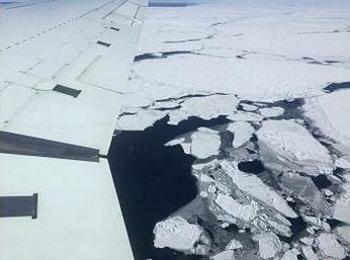 NSIDC scientist Stroeve was in Svalbard during November and noted the lack of sea ice. “Typically sea ice begins to form in the fjords at the beginning of November, but this year there was no ice to be found,” she said. Today, Arctic sea ice is still in the early stages of winter freeze-up, and it is expected to continue expanding until it hits its maximum extent around March 2017. In the Southern Hemisphere, sea ice surrounding the continent of Antarctica declined quickly early in November and set a record low. The average extent for November was 14.54 million square kilometers (5.61 million square miles). That extent is 1.81 million square kilometers (699,000 square miles) below the 1981 to 2010 average and more than twice the previous record departure from average set in November 1986. At the southern pole, NSIDC scientists said that higher-than-average temperatures and a rapid shift in Antarctic circumpolar winds appear to have caused the rapid decline in Antarctic sea ice. Air temperatures two to four degrees Celsius (four to seven degrees Fahrenheit) higher than average and an earlier pattern of strong westerly winds worked to create a more dispersed sea ice pack in the Antarctic. A rapid shift to a more varied wind structure, with three major areas of winds from the north, rapidly compressed low-concentration sea ice around Wilkes Land, Dronning Maud Land, Enderby Land, and the Antarctic Peninsula. Several very large areas of open water within the ice pack have opened in the eastern Weddell Sea and along the Amundsen Sea and Ross Sea coast.